Note: Although this procedure seems to work I found the machine was not stable. 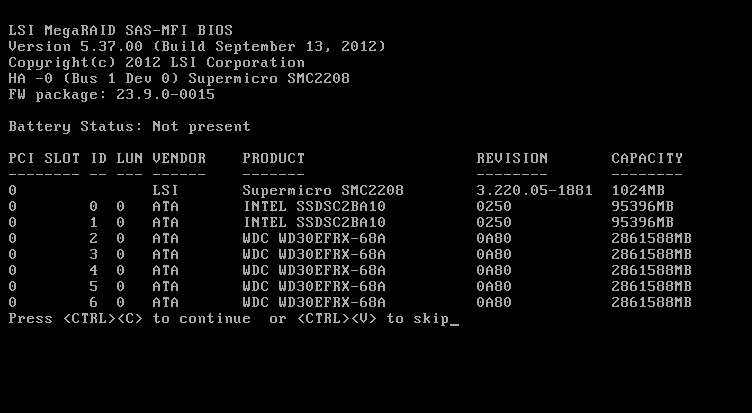 How to configure disks for JBOD mode on a LSI 2208 controller on a Supermicro X9DRH-7TF motherboard. This is so the disks can be used in a ZFS Pool. This is done using the BIOS preboot CLI. In theory it should be done in any OS using the command line tools. However the NAS4Free distribution doesn't seem to have a command line tool installed by default. List the available physical devices to get the enclosure number and drive identifier. Note that because the terminal emulation doesn't allow scrolling back and the amount of information well exceeds what fits on a page, the '-page24' providing basic paging support. The PDList also provides field 'Firmware State'. Mark each of the devices as 'good'. Use the output of the PDList command to determine the enclosure and slot identifiers. The BIOS level command interface required a 'force' parameter to perform the action. The 'force' option had to go before the adpater option. Adapter: 0: EnclId-252 SlotId-1 state changed to Unconfigured-Good. Adapter: 0: EnclId-252 SlotId-2 state changed to Unconfigured-Good. Adapter: 0: EnclId-252 SlotId-3 state changed to Unconfigured-Good. Adapter: 0: EnclId-252 SlotId-5 state changed to Unconfigured-Good. Adapter: 0: EnclId-252 SlotId-6 state changed to Unconfigured-Good. Adapter: 0: EnclId-252 SlotId-7 state changed to Unconfigured-Good. Make each of the disks to be in JBOD mode. Adapter: 0: EnclId-252 SlotId-0 state changed to JBOD. Adapter: 0: EnclId-252 SlotId-1 state changed to JBOD. Adapter: 0: EnclId-252 SlotId-2 state changed to JBOD. Adapter: 0: EnclId-252 SlotId-3 state changed to JBOD. Adapter: 0: EnclId-252 SlotId-5 state changed to JBOD. Adapter: 0: EnclId-252 SlotId-6 state changed to JBOD. Adapter: 0: EnclId-252 SlotId-7 state changed to JBOD. 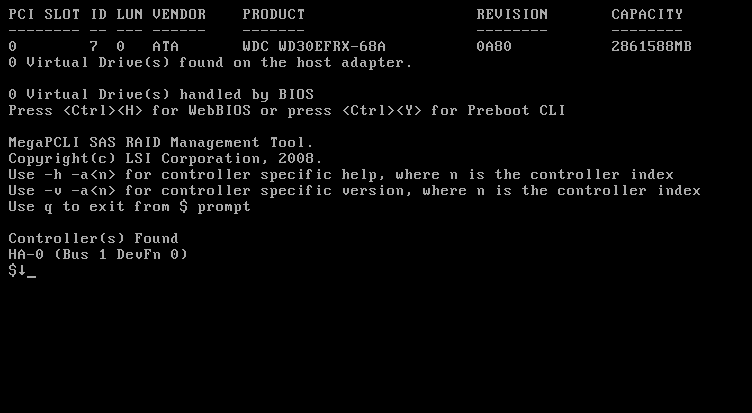 When the motherboard reboots, the following output is provided by the LSI 2208 BIOS. The motherboard was delivered with v23.9.0-0015 firmware. Nas4Free/FreeBSD sees the drive with 195371568 (0xba52230) sectors, which is the same as the 'Raw Size' (in sectors) above. 12161           # Cylinders according to firmware. The command needs a 'force' option. The force option seems to need to go before the adpater option. this drive.If it is a file system drive, please unmount it. Adapter: 0: Failed to change PD state at EnclId-252 SlotId-0.